The Great Pyrenees descended from the ancient Tibetan Mastiff and, more recently, from their descendants, the Mollossian Hounds brought to Spain by the Romans. They became established in the Pyrenees Mountains on the France-Spain border, where they were bred true-to-form in virtual isolation for about 1,000 years. 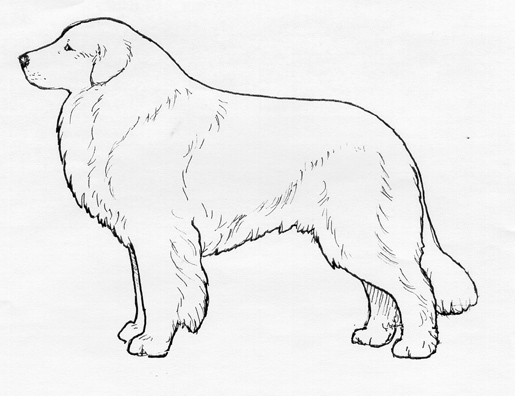 The Great Pyrenees has been used for centuries as a watchdog in its native land. This is in addition to its original function as a flock guard dog. 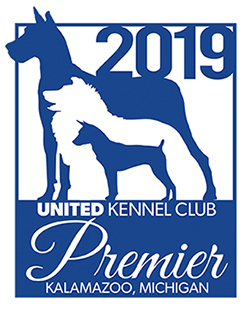 The Great Pyrenees was recognized by the United Kennel Club in 1949. The Great Pyrenees is a breed of immense size, great majesty, keen intelligence, kindly expression, unsurpassed beauty and a certain elegance. It is strong yet agile. The Great Pyrenees has historically been left on its own to protect the flocks; therefore it is a breed with a propensity for independence and a sense of authority. The breed has an innate gentleness, and grows very attached to those it is protecting. The head is not too large in comparison to the overall size of the dog. It is fairly flat on the sides. At its widest point, which is between the ears, the width of the skull equals its length. The skull is slightly rounded, with an apparent occipital protuberance. The forehead is not pronounced, and the median furrow between the eyes is barely perceptible. The stop is a gentle slope. Broad and well filled below the eyes, the muzzle tapers gently from stop to tip, forming a blunt wedge when viewed from above. It is slightly shorter in length than the skull. The lips cover the line of the lower jaw without looseness. The Great Pyrenees has a full compliment of strong, white teeth that meet in a scissors bite. An even bite is tolerated as are the two middle bottom incisors being slightly out of line. Always completely black in color. Disqualification: Nose not completely black. Rather small and almond shaped, set slightly obliquely, and amber-brown in color. Expression is intelligent, contemplative and gentle. Serious Faults: Flesh colored eye rims. Yellow eyes. Fairly small, triangular in shape, rounded at the tips and set on a line with the outer corner of the eye. They are carried flat against the head, slightly raised when the dog is at attention. Strong, relatively short, and free from dewlap. The shoulder blades and upper arms are fairly long and well muscled. They form a moderate angle. Straight and strong, with slightly oblique pasterns. Single or double dewclaws may be found on the front legs. The length of the body, from the point of the shoulder to the point of the buttocks, is slightly greater than the height at the withers. The chest at its deepest point is approximately, but never more than, one-half the height at the withers. The chest reaches to, but does not fall below, the level of the elbows. The back is strong and level. The loin is of moderate length and the croup is gently sloping with fairly prominent haunches. The ribs are slightly rounded and there is very little tuck up. The angulation of the pelvis and the femur matches that of the forequarter. The thighs are well muscled and of moderate length. There is moderate angulation at both the stifle and the hock. There are double dewclaws on both rear legs. Disqualification: Lack of double dewclaws on the rear legs. Compact, with slightly arched toes. Long, reaching at least to the hock joint. Carried low in repose with its tip preferably forming a hook. When the dog is alert, the tail rises and is carried in a ‘wheel’, with only the tip touching the back. Dense and double, topcoat fairly long and flat and with a crisp feel around the shoulders and back. The hair is longer on the tail and on the neck, where it might be slightly wavy. The trouser hair, which is fine and wooly, is very thick. Solid white, or white with color patches that are either grey (badger or wolf), pale yellow or orange (shades of tan). The patches appear on the head, ears, base of tail and sometimes on the body. Disqualification: Any color other than those specified. Height range for males is 27.5 inches to 31.5 inches. For females it is 25.5 inches to 29.5 inches. Faults: Over or under the preferred size ranges. Powerful and free, extended rather than fast and showing a certain suppleness and elegance. Lack of double dewclaws on the rear legs. Any color other than those specified.